When the 2022 World Cup hosts announced the selection of general contractors, works on the actual site of Al Bayt Stadium were already underway. Not construction yet, but enabling works, including significant excavations to make way for foundation laying. Official groundbreaking will take place in September, but the site is already busy. Container town for construction management is set up and heavy equipment is arriving. Interestingly, the management centre, just like the future stadium itself, resembles a traditional Qatari tent. At peak it’s expected some 2,700 workers will be hired on site, mostly from Asia. The Supreme Committee for Delivery and Legacy, being under constant scrutiny of human rights organizations, began its announcement of groundbreaking with information about modern worker accommodation being prepared on site. 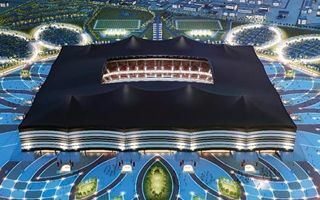 New stadium in Al Kohr (roughly 40km north of Doha) will hold 60,000 people and consume some €770 million. Consortium led by Salini Impregilo has three years to deliver the stadium. September 2018 leaves a long time to prepare for the 2022 World Cup. This means that initial capacity will be retained for no less than 4-5 years. After the tournament 28,000 seats are to be dismantled and offered to a developing nation.